The Lyme disease test screens for Lyme disease blood antibodies and helps screen for a Lyme infection. What is a Lyme disease test? A Lyme disease test screens for Lyme disease in the blood. Why is a Lyme disease test important? A Lyme disease test is important because it can identify a treatable Lyme disease infection. This Lyme Disease Test is a blood test. The Lyme disease test, also known as a Lyme disease blood test, Lyme disease screening test and a Lyme test, measures Lyme disease antibody blood levels. Lyme disease is an infection spread by ticks (Ixodes) containing the Borrelia burgdorferi bacteria. Sometimes known as Lyme borreliosis, Lyme disease usually infects humans when the tick has been attached for at least 36 hours. Unlike other types of infectious diseases, Lyme disease cannot be transmitted between humans or animals. Lyme disease can cause a wide range of symptoms targeting a number of different organs and systems in the body. Classically, Lyme disease presents with an bullseye-shaped rash around the area of the tick bite known as erythema migrans although not every person gets one. Untreated, Lyme disease can lead to chronic joint pain, heart abnormalities, memory problems and long-term fatigue. This Lyme disease test starts with an antibody screen using an immunoassay methodology to look for evidence of Lyme disease. As can be seen on the Lyme disease sample lab report provided in the link above, the test results are available under the result column and can be compared against the Lyme disease antibody interpretive criteria provided by the laboratory. If the initial Lyme disease screening test is positive, a second test measuring Lyme disease IgG and IgM antibody levels will be performed at no extra charge to confirm the initial positive result. It is possible to get a false-negative Lyme disease blood test result (i.e. the test comes back negative when Lyme disease is present) if one gets tested too quickly after the initial tick exposure. In these situations, the immune system did not have enough time to generate enough Lyme disease antibodies to be measurable using current technology and, if concern continues to exist, the Lyme disease blood test should typically be repeated at a later date. To get the Lyme disease test near you, simply order online and get tested at the selected Quest Diagnostics lab location. Once the Lyme disease test results are available, they will be available for download. Many people wonder whether fasting is required and how long results take for the Lyme test. Fasting is not required when getting a Lyme disease blood test and results are typically available in 4 business days or less. 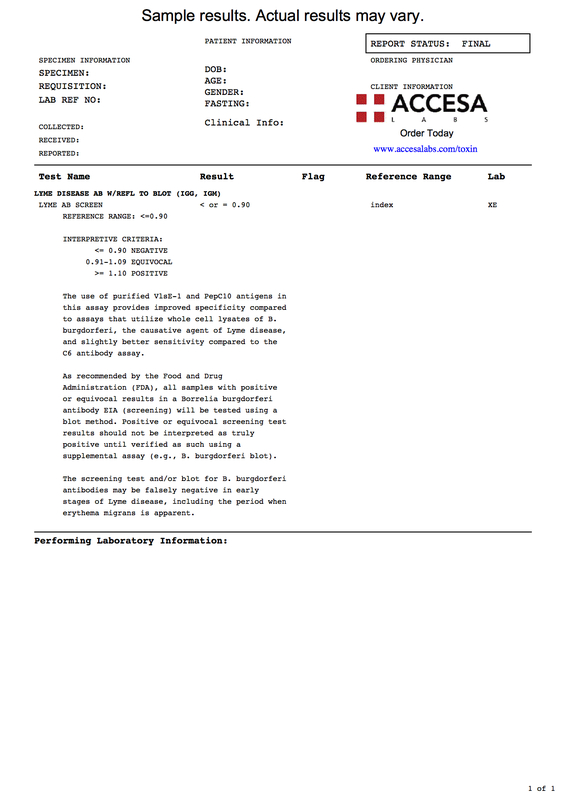 As can be seen on the sample Lyme disease screening test report above, the Lyme antibody screen will report the antibody levels which can be compared against a reference range provided by the lab. If Lyme disease antibodies are detected, the Lyme western blot test will be performed and reported to provide more detail. If one is interested in trying to identify the presence of Borrelia spp DNA specifically, the Lyme PCR test. This Lyme disease test is a component of the more comprehensive infection panel test that screens for a variety of infections. In most cases, Lyme disease can be treated effectively with common antibiotics such as doxycycline, cefuroxime and amoxicillin. The risk of being exposed to Lyme disease in the first place can be reduced by avoiding regions with infected ticks. When in an at-risk location, it is recommended to wear a hat, long sleeve shirts and long pants and to use insect repellants like DEET. A recombinant Lyme vaccine used to exist but is no longer available. Lyme Disease Test at Guaranteed Prices.